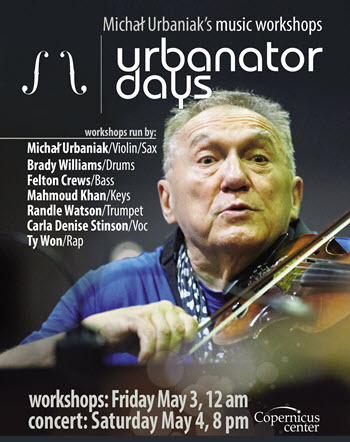 Michał Urbaniak’s ‘ Urbanator Days ‘ is a two-day musical event including a day of instructional workshops followed by a concert (jam session). Developed in 2005 by Michał Urbaniak and his Team, the project has grown and expanded annually to many locations. On May 3rd & 4th, Urbanator Days comes to Chicago. Michal Urbaniak is a world class violinist, saxophonist and composer. During Urbanator Days you will take part in workshops run by the world’s leading and most talented young vocalists, jazzmen, rappers and music passionates. If you play an instrument, create music and love what you do – register via email and come to celebrate music with us. Space is limited to the first 200 ticket holders. Past Urbanator Days events have proven to be a hugely successful. This Chicago event is a unique opportunity for music schools, university students, as well as all talented young people to take their talent to a new level with the best musicians. The Workshop is led by international members of the Urbanator Team. Many musicians have taken part in the project, among others, Frank Parker, Femi Temowo, Otto Williams, Al MacDowell, Andy Ninvalle, Troy Miller, Xantone Blacq, Michael “Patches” Stewart and Marcin Pospieszalski. The workshops starts with greetings by Michał Urbaniak and the Urbanator’s artists. Several special exercised will then be conducted to enable increased concentration and expanded musical perception. Next, different styles and music techniques will be submitted. Artists present vast possibilities of performing particular music material in various styles – from Dixieland, soul, rap, blues to hip-hop. They will pay particular attention to correct realization of different rhythms and characteristic rhythmic structures. Moreover, they will share their knowledge of various styles of non-symphonic music. Urbanator Days is one of the most innovative music events in the world. We invite you to join this unique experience with personalities of international music scene. This is truly a once in a lifetime opportunity! IMPORTANT RSVP: To take part in Workshops, copy/paste & answer the questions below. ► Email your answers to [email protected] with SUBJECT: Urbanator Days. See you at Urbanator Days!